Pompeo Says The U.S. Troop Withdrawal From Syria Is Just A 'Tactical Change' Secretary of State Mike Pompeo is traveling through the Middle East as confusion mounts over U.S. policy in Syria. U.S. Secretary of State Mike Pompeo (center) visited Bahrain on Friday. Seeking to quell concern about the U.S. troop withdrawal from Syria, Secretary of State Mike Pompeo on Saturday described the American exit as a "tactical change" in military strategy that wouldn't deter efforts to defeat ISIS or hurt U.S. interests in the region. 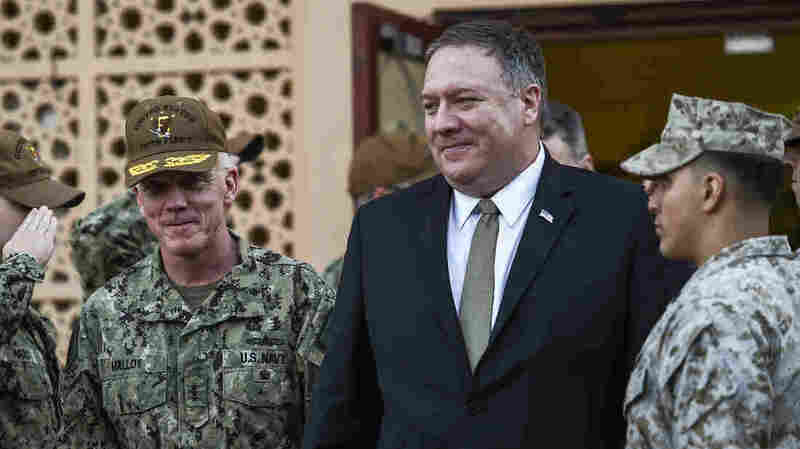 Pompeo's remarks in Abu Dhabi, the capital of the United Arab Emirates, come after the Pentagon announced Friday that "the process of our deliberate withdrawal" had begun. President Trump's unexpected announcement last month that troops would leave the country has fueled fears that a power vacuum could strengthen ISIS and cede influence in the region to Iran and Russia. It also provoked concerns about the safety of Kurdish forces who fought ISIS alongside the U.S. in Syria but are considered terrorists by Turkey and its president, Recep Tayyip Erdogan. "We recognize the Turkish people's right and President Erdogan's to defend their country from terrorists," Pompeo said Saturday, according to NPR's Michele Kelemen, who is traveling with the secretary. "We also know that those who aren't terrorists, those who were fighting alongside of us for all this time deserve to be protected as well," Pompeo said. "We are confident we can achieve an outcome that achieves both of those." Erdogan has said his military is prepared to attack swaths of Syria under the control of the Kurdish People's Protection Units. In a televised speech in December, he said Turkey's army would be ready "neutralize terrorist organizations" in upcoming months, according to the Financial Times. When Pompeo said earlier this month that the U.S. wants to ensure "the Turks don't slaughter the Kurds," Turkey denounced Pompeo, saying he exhibited "a worrying lack of information." Erdogan also canceled a meeting with Trump's national security adviser, John Bolton. No U.S. personnel have left Syria yet, according to a Pentagon spokesman. A separate spokesman for the anti-ISIS coalition declined to discuss timelines, locations and troop movements, as NPR's Bill Chappell reported. More than 2,000 U.S. troops are serving in Syria. Their exit has not just alarmed the nation's Kurds, but even Christians in the country are afraid of what could happen after the U.S. troops leave, says Bassam Ishak, president of the Syriac National Council of Syria and a U.S. representative of the Syrian Democratic Council, the political arm of the Syrian Democratic Forces, a U.S.-backed Kurdish group. Kurds and Christians in the northeast region "have tried to put together this pluralistic model which is based on secularism," he told NPR. "We stand to lose our way of life, we also stand to lose our property and our livelihood," said Ishak. "We will be like second-class citizens at best, if we survive as Syriac Christians and Kurds." Pompeo told reporters that he spoke with Turkey's foreign minister, Mevlut Cavusoglu, on Saturday. He said many details around the troop withdrawal still need to be ironed out, but that he was optimistic a "good outcome" could be reached between Turkey and Kurdish groups in Syria. Just because a "couple thousand uniform personnel" will be leaving Syria, Pompeo said, doesn't mean that U.S. interests have changed. Nor will it stop the United States from trying to get "every Iranian boot out of Syria," Pompeo said. He described a "big and growing" coalition to exert pressure on Iran. After U.S. Troops Leave Syria, What Happens Next? Special representative for Syria Jim Jeffrey, a former U.S. envoy to Turkey and Iraq, is expected to return to Turkey to continue discussions, Pompeo added. Trump's decision to call back U.S. troops in Syria, who were first deployed in 2015, was followed a day later by the resignation of Defense Secretary Jim Mattis, who wrote a letter to the president saying he had the right to have a secretary of defense "whose views are better aligned with yours." The president's announcement also accelerated the resignation of Brett McGurk, the special envoy to the coalition fighting ISIS. Turkey's president wrote in a New York Times op-ed that Trump "made the right call." Pompeo also spoke about the partial government shutdown, which has become the nation's longest. "Morale is good" among diplomats, he said. "They understand that there are squabbles in Washington, but their mission remains, their duties continue and they're executing them." The secretary, who began his trip in Amman, Jordan, on Tuesday, is expected to visit Qatar, Saudi Arabia, Oman and Kuwait before returning to Washington.